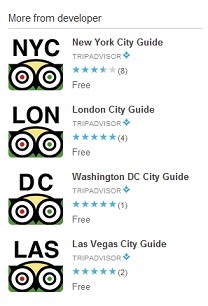 TripAdvisor today announced the launch of free Mobile City Guides for Android. The new apps, currently available for 20 popular world cities, offer convenient smartphone access to a wealth of detailed destination information including traveler reviews on hotels, restaurants and attractions, as well as suggested itineraries and offline-accessible interactive walking tours. The Mobile City Guide apps are automatically synced with the freshest TripAdvisor content available so users can access the latest traveler reviews and opinions on the go. Additionally, the Mobile City Guides offer walking tours and insider tips that can be viewed on the app without a data connection, including in-depth information on neighborhoods, history, culture, architecture, weather and transportation. Access to offline information is particularly useful for travelers abroad, who can download the apps before they go, sparing them from expensive roaming charges. The Mobile City Guides’ interactive walking tours and suggested itineraries offer detailed city insights from TripAdvisor travelers as well as professional writers, publishers and destination marketing organizations. For example, in Florence, a traveler can follow the best way to see artisan workshops of the historic Oltrarno Quarter, according to a local TripAdvisor Destination Expert, complete with a map, photos, tips and suggestions. TripAdvisor Mobile City Guide apps are currently available for the following destinations: Amsterdam, Barcelona, Beijing, Berlin, Boston, Chicago, Florence, Hong Kong, Hawaii, Las Vegas, London, Los Angeles, New York City, Orlando, Paris, Rome, San Francisco, Sydney, Tokyo, and Washington D.C. The Mobile City Guides are available for free in the Android Market. Travelers can also download the free TripAdvisor app, which recently hit 10 million app downloads across all platforms.